"These are stories and poems with purpose, stories and poems with heart, stories and poems we are proud to present. The first of two very popular and unique anthologies of short stories that were written to be read aloud to the elderly, A Loving Voice offers an imaginative and creative way for professionals, family members and friends to reach out to, communicate with and entertain the older people in their lives or in their care, particularly those who are bed-ridden, have diminished sight, and those with dementia. In a moment of inspiration that has been much-welcomed by caregivers the world over, the idea for A Loving Voice came to its editors, Carolyn Banks and Janis Rizzo, when they recognized the serious lack of good reading material for this large and ever-growing segment of the population. In an effort to fill this void, they invited writers to submit original stories and poems for their anthology. From the hundreds of submissions they received, they chose 52 selections (one for each week of the year) that they, and the eldercare experts they consulted, believed would be most meaningful and entertaining for an older audience. The stories evoke nostalgic memories and warm feelings of the past, interesting stories that stimulate conversation, and provide a bridge between the past and present. All of the selections can be read in one sitting (no longer than 10 minutes), have easy-to-follow plots, and simple dialogue that lends itself to reading aloud. As Carolyn Banks reports in preface to the book, "The pieces we have chosen are not insultingly simple. Even those who are able to read these selections on their own will find them engaging and entertaining. These are stories and poems with purpose, stories and poems with heart, stories and poems we are proud to present. Each we hope will help you find your own loving voice." The book includes short stories and poems written by an impressive array of American authors including Louise Erdrich, Shelby Hearon, Carolyn Osborn and Paul Estaver. 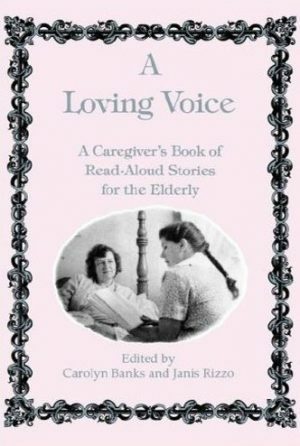 This book, and its accompanying second volume, A Loving Voice II: A Caregiver's Book of More Read-Aloud Stories for the Elderly, has received critical acclaim from both professional and non-professional caregivers and has been enthusiastically welcomed for its unique and inventive method of communicating with, and bringing some moments of pleasure to, older adults.